You want to outsource your employee engagement survey — that’s awesome! A great employee engagement survey vendor can improve efficiencies, make your job easier, and provide you with great engagement insights. But not all survey partners were created equally. Put your employee survey company to the test. 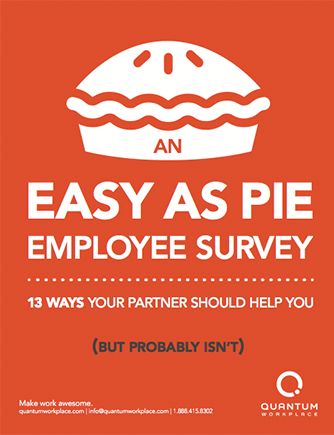 Read our ebook, An Easy as Pie Employee Survey: 13 Ways Your Partner Should Help You (But Probably Isn’t), to discover what you should expect from an awesome partnership.